If you love Barbie you will adore this Barbie Sisters Cruise Ship. 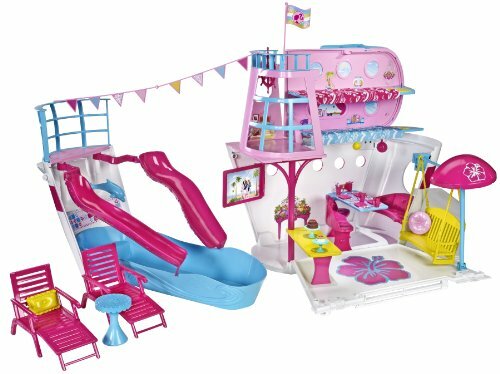 Barbie likes to enjoy life in styles and luxury – so of course this Barbie Sisters Cruise Ship is a fabulous addition to her lifestyle! 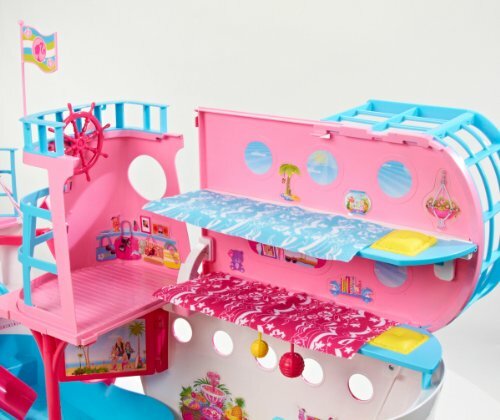 The Barbie Cruise Ship has been created for Barbie and her family to sail the ocean in style. This new Babrie toy includes several areas for play and many realistic accessories. With any Barbie toy what you will look for first is playability value! This Barbie Cruise ship is a great choice as it is large enough for several dolls to play in it at one time. But parents will be glad to hear that even though it is a decent size for play, the cruise ship can be folded up when to be put out of the way when not in use. 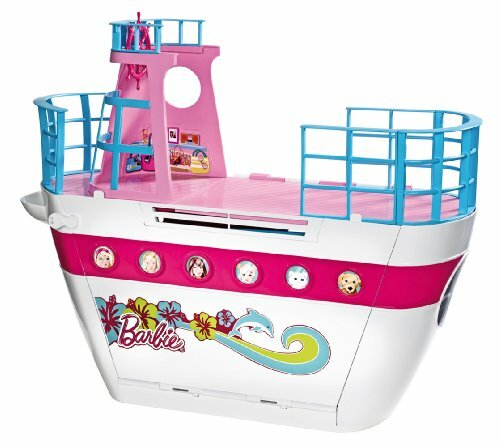 The Barbie Sisters Cruise Ship is brightly colored and an attractive shade of pink and blue. 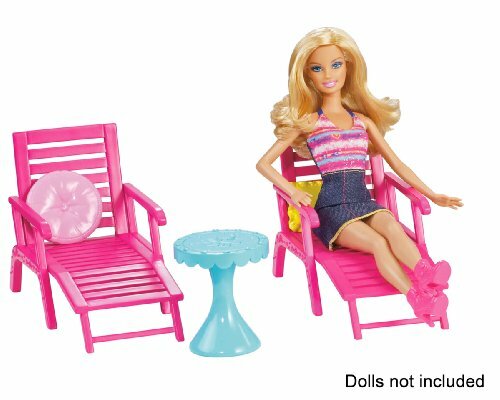 The top deck is large enough for two dolls to relax on the deck chairs and soak up the sun! All cruise ships need a swimming pool and of course Barbie’s cruise ship has one! You can fill up the pool with real water. The pool has 2 water slides and a dolphin fountain. Barbie and her friends can spend many happy hours around the pool – just like on a real cruise. A big part of all cruises is the food. Barbie and her friends can enjoy the buffet – just like a real cruise ship! 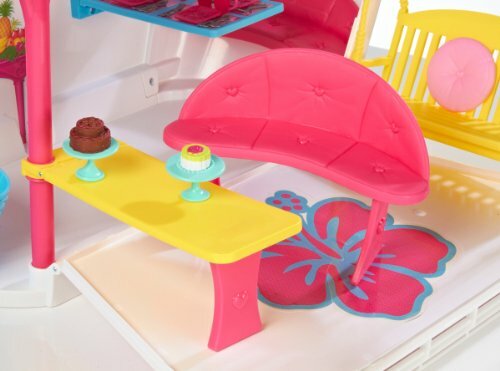 The Barbie dolls also need a place to sleep – there are 2 fold down beds so that they can make sure they get their beauty sleep! As the Barbie Sisters Cruise Ship has some small parts it is not recommended for children under the age of three. The Barbie cruise ship does need some assembly but reviewers seem to mostly say that this is quick and easy to set up. You have to add the sticker decals to the ship – but this is often part of the fun and kids enjoy doing this or helping a grown up to add the decorations. The Barbie Sisters Cruise ship would make a great Holiday gift. It is an impressive size at over three and a half feet wide (remember it folds for storage so won’t take up too much room). This would be a huge hit on Christmas morning! This toy is sure to be a huge hit over the Holidays and is already one of the most popular toys for Christmas this year. 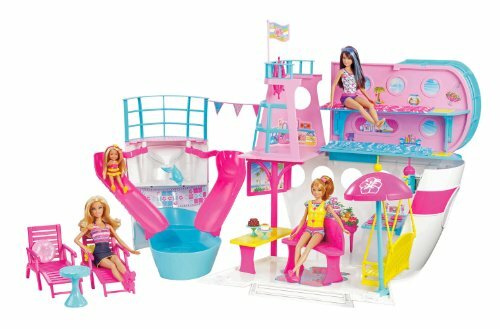 The Barbie Sisters Cruise Ship is one of those toys that is sure to get many hours of play value and fun for your child. It’s Here, It’s Here! Dwell Studio Kids is Live @ Hautelook! Olay Professional Pro-X Exflicating Cleanser just $7 Shipped!